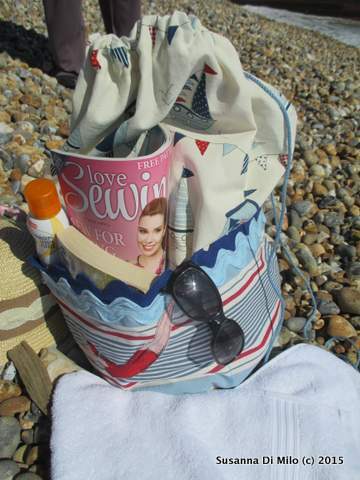 Hello, isn’t it wonderful sewing weather? 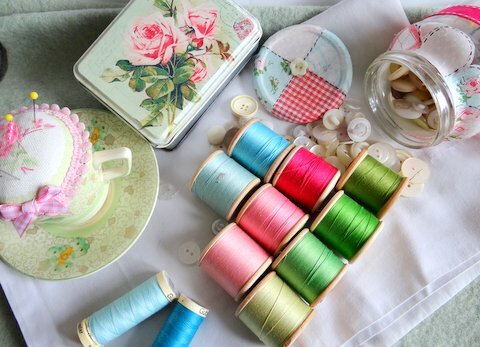 Just right for settling down in a cosy corner, radio playing softly in the background and the little bernina singing away…bright bobbins of thread, pretty little pins and a large steaming pot of tea at the ready. 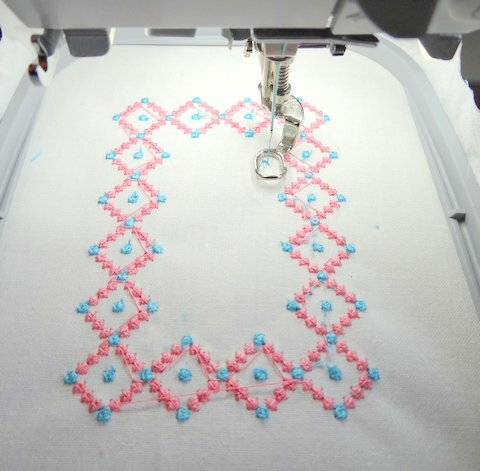 I was doing a little calculation – it has been nearly 11 years since I bought my sewing machine; one of the new wave of embroidery options and an odd sort of love affair ever since – mostly because I haven’t spent time exploring the software and playing with the machine. A couple of prompts put it higher on my to do list. 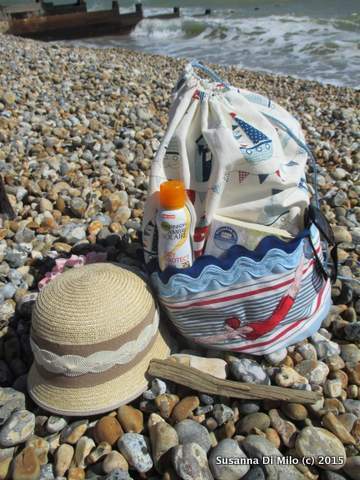 We met an inspirational textile artist on the Art Trail this year, using machine embroidery and I also sat at the sparkly shiny new Brother version at the Three Counties Quilting Show; but there have been a few bumps on my journey to sublime stitchery. It was a hefty investment but I was flush with funds and wanted something significant rather than simply frittering it away. The machine cost £1500 and there were many embroidery designs you could buy at the time, but I wanted to design my own. The software was another £1000 – I decided to go for the cut down version at an eye watering £700. I notice the software is still around the £1000 mark, I am guessing this might be because it is still not widely used. There is a cheaper alternative called Embird – which creates designs that you save into the relative format for your machine, currently its only about £200 with add ins. At the time I was teaching ICT as well as being the network administrator for the school, so my confidence in my IT skills was running high but the software was really baffling – completely different from any other software I had used before. The manuals did not help – they referred to buttons and icons that only existed in full version. It was shelved, I used the machine to make things and forgot all about machine embroidering. 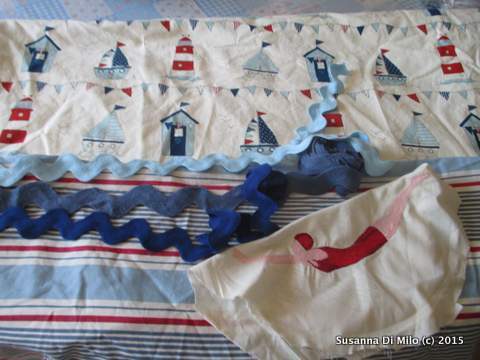 A few years later I bought designs – but it was still a hit and miss process, getting the design centred to the exact spot was a challenge and it was impossible to hoop a quilt despite the advertisements. I have a quit top but it started to go wrong – months of work ruined. It was shelved again! Two years later I dusted it off and tried again – it stopped half way through the design, each time. I took it to a sewing machine service shop I was told the board had gone in the machine and it would cost £1,000 for a new one. In the end Bernina UK took it back and replaced the board for free, which was great of them as the warranty had long past. Luckily the machines record time spent using them and I had only used the module 72 hours in 7 years! Yesterday I decided to have a much needed play day, so I fired up my ancient laptop, and opened up the programme. 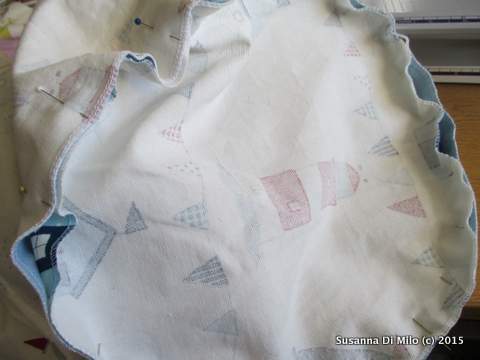 It has three useful elements, one is for embroidery, one is for creating cross stitch and one is for designing quilts and will also create pattern templates to print. I thought I would try my hand at cross-stitch. I have collected quite a few lovely pattern books and thought I would start transferring some of them into digital format. 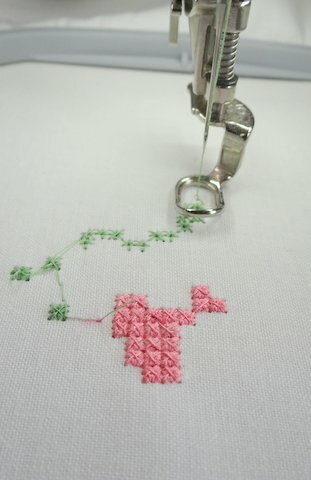 The cross-stitch software is quite exciting to use: you load in your thread colours using the drop down menus and then you have the option to decide what type of stitch, from outline, cross, double cross, upright cross, etc. 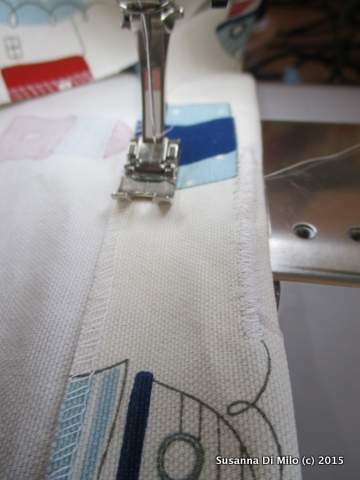 At the click of a mouse you create a stitch, with a sweep of a mouse you create lots of stitches! I tried to replicate a pattern but it was making me cross-eyed! 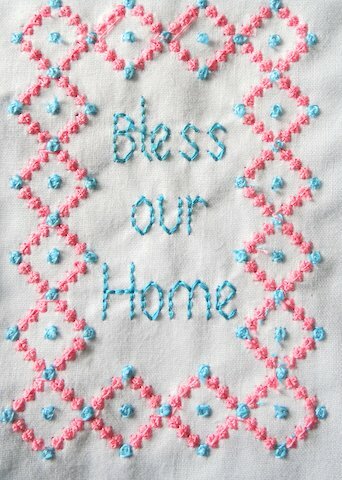 It is a laborious process – all the time I was wondering if it might be quicker to simply stitch it myself. 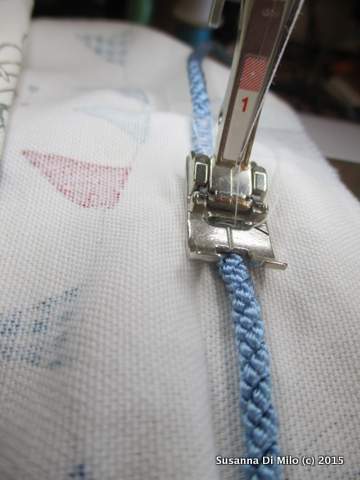 However, once it is created you can stitch it out easily and quickly. 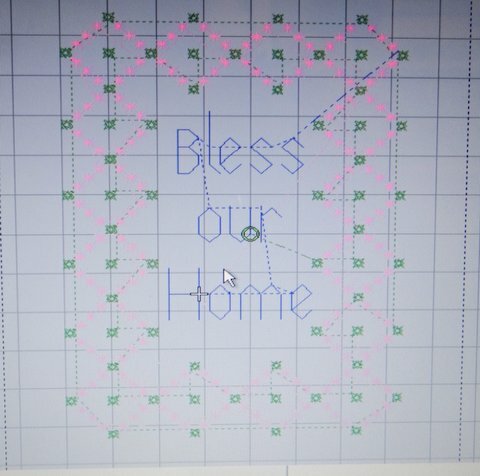 So.. a little while later I have my design. I I cheated a little, it was so much easier to simply draw out my design than copy an existing chart – but it looks ok. 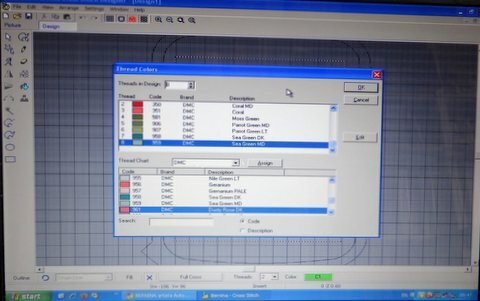 The software has options for you to scan material and use it as a back ground which will give you a great idea of how the embroidery will look. 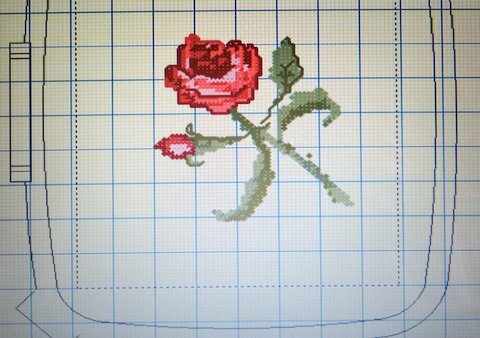 (you can do this with the quilting programme as well). 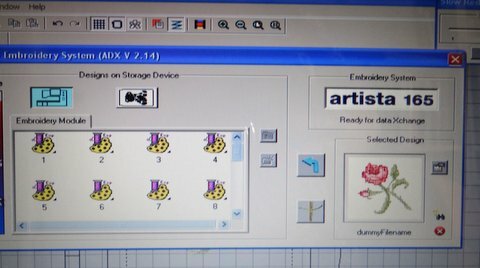 Sending the design to the machine is yet another simple click of the button – I have a long lead that goes from computer to machine, but the later versions have USB connectors now. 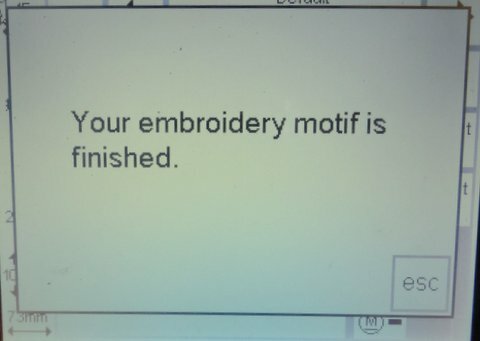 I know when I saw the brother machine at the Quilting Festival, you could simply place a drawing in the scanner and it would simply stitch it out from there, things have become even easier. However, I quite like watching it make its merry way down the wire! In a relatively short space of time the design is finished.. oh dear! I think I used the upright cross for this and it hasn’t stitched out as well as I would have liked. 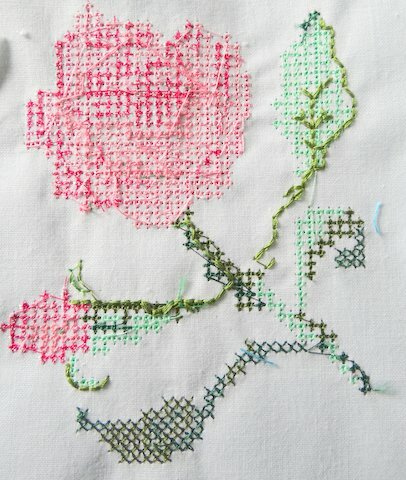 I like the darker green leaf at the bottom but the rose has not come out very well at all. You can see some thicker darker thread on the green – this is some vintage thread I bought in a garden sale last summer, it is slightly thicker than the normal thread. Upright crosses give a grid like effect to the pattern – which is not as pretty as I had hoped. 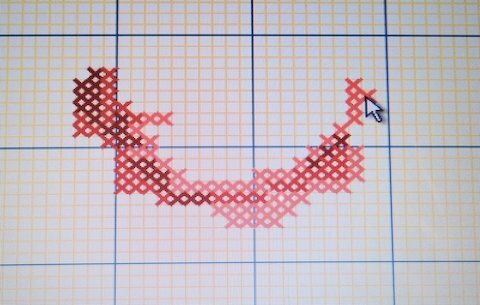 The cross-stich size look good – the software gives you many options for sizing from 10 stitches per millimetre upwards. I wanted a ‘hand’ done look so went for a medium size. 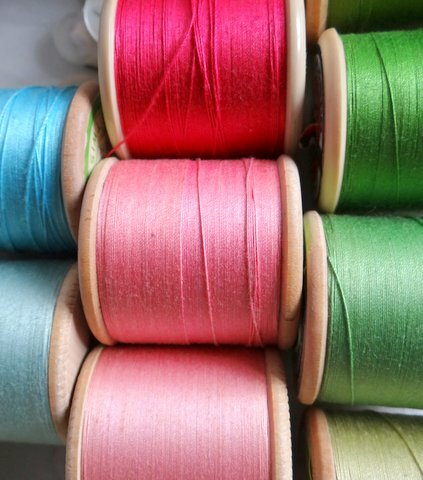 The threads are too thin – there are options for 2, 4 or 6 strands of thread per stitch so for ordinary thread it would be better to use a 6 strand. However the vintage spool of thread looked perfect so I thought I would try another design using those. 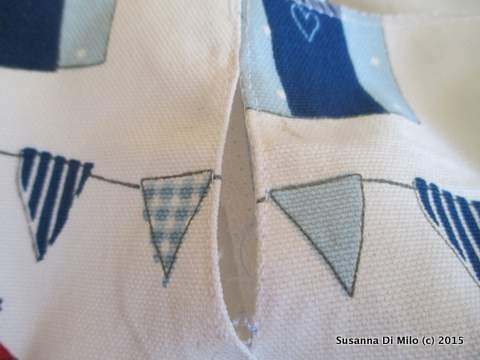 This time I used a star-stitch with the thicker thread it made the stitches sit very proud. The stitch is built up by the machine gradually getting bigger so they form a pretty dome. 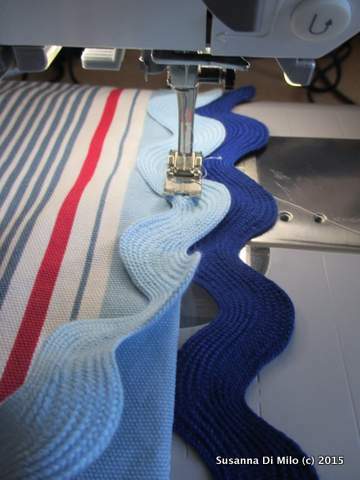 Watching the machine stitch out is quite magical and mesmerising! Hours of hand work done by machine in 10 minutes. 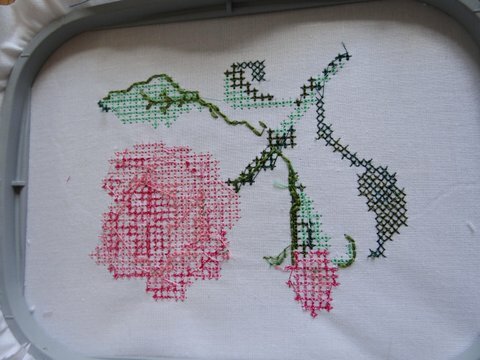 I did have a lovely blue border round this design, as well as some outline stitch to bring this rose to life – but I decided to stop there as I was rather pleased with the stitching but not the design. 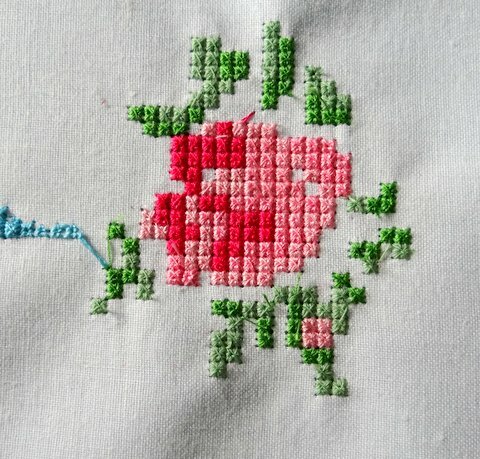 The definition of the rosebud is not there, as I mistakenly used the same colour twice so the mid tones are lost. It is a good idea therefore to keep a chart or a note of the colour order. 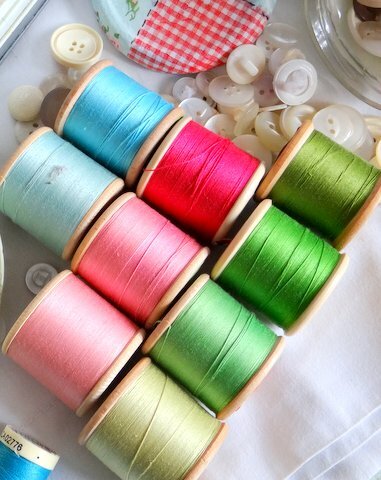 Mindful that I also had a limited supply of the vintage thread – I did not want to waste it on experimentation. 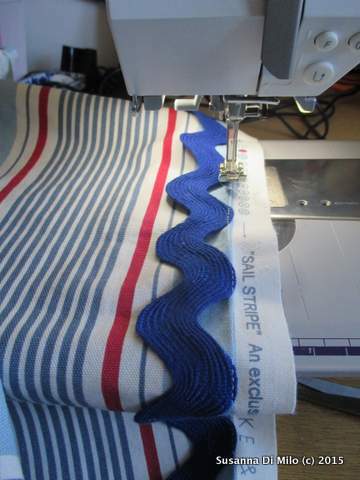 I had an iron on stabiliser – which was excellent at keeping the fabric rigid to take the design. Without it the fabric begins to move and the accuracy goes down. 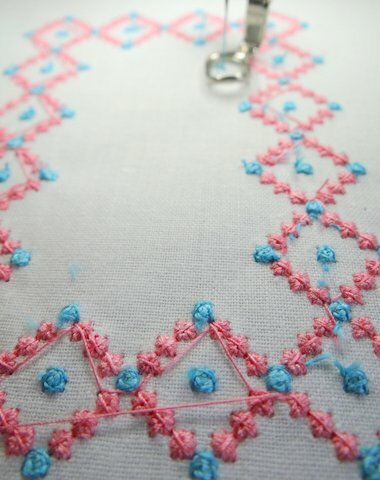 I thought I would try a more open design – I love the pretty star shaped stitches so combined them with the double crosses. Then I used a outline stitch for some wording. 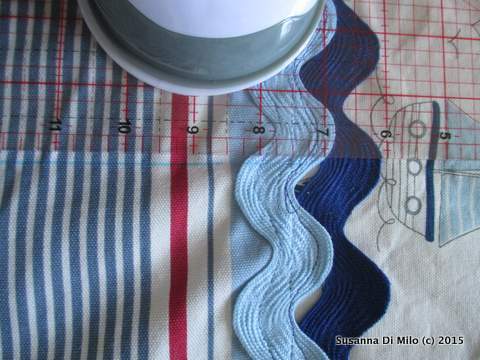 The distance between stitches created long threads, that got caught up in the stitching of the following colour. To rectify this a little – I took the risky decision to stop the stitching and remove the frame and cut the tails off. Its probably not a good design to have just one stitch here and there. The removal of the frame did not affect the alignment of the stitches and the design lined up perfectly. 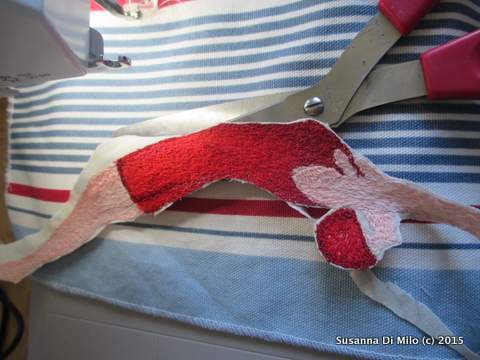 Tails did however make this embroidery a bit of a challenge afterwards. Cutting the stitches did leave them a little furry, so it is better to do a small group rather than a single stitch when designing. 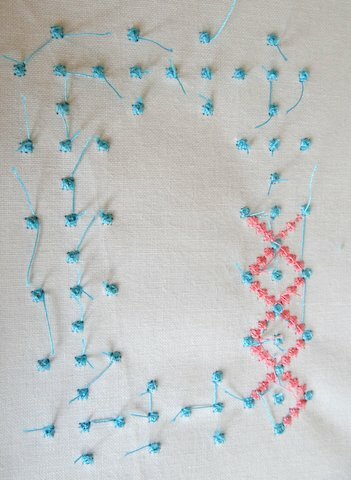 You can see how raised these stitches are – the pink eight point stars look very effective but I will experiment with stitch size next time and maybe with a thinner thread to see if the stitch becomes more defined. 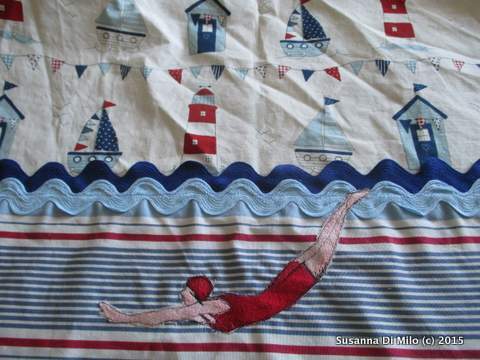 I really love the outline stitch here – it has a hand made quality that thrills me, as I was hoping to have the nature and feel of hand stitched with the speed of machine stitched. 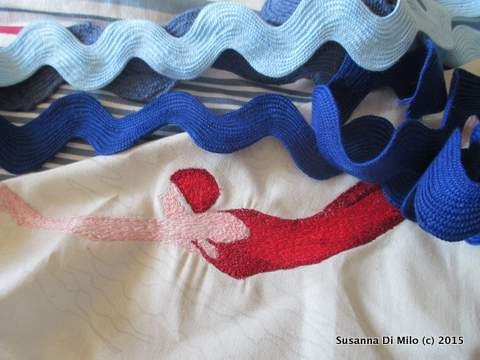 All in all an interesting way to spend time – and I am beginning to fall in love with my embroidery module – if at first you don’t succeed try again, and again, and again..